Now you can put all your worries behind when you use us for your OR Tambo airport shuttle services. We cater to corporate clients, tourists and company employees and provide a superior service that is convenient and timely. An important aspect of our business is offering an airport shuttle Pretoria to OR Tambo by means of the most stylish vehicles. Whether you need an airport to airport, door to door or airport to lodge service, be guaranteed of a hassle free and relaxing journey to your preferred destination. Once you make a reservation online or by calling us, you are assured that we will dispatch a driver ahead of schedule. Our immaculately dressed and friendly driver will be waiting for you and will adhere to all road safety standards. All our vehicles are clean with adequate air conditioning and extra comforts just for your use. At OR Tambo airport shuttle service, we take no chances when it comes to creating a wow factor for all our clients. 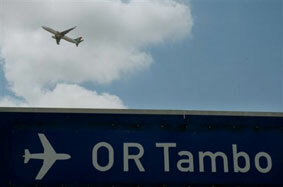 Our main business is providing Airport shuttle services to and from OR Tambo, & Lanseria airport. However, we also service all areas of Gauteng region, Johannesburg and Pretoria. If you prefer to be picked up at your door, we can provide this stress free and with the least inconvenience. That is a promise! With a 100% satisfaction guaranteed shuttle service, you can avoid the risk of leaving your vehicle at the airport or the hassles of finding a parking spot. Many years of experience has seen OR Tambo airport shuttle service earning the reputation of a leading and secure company that is in line with the latest worldwide trends. We take great pride in our principles and in house procedures that ensure you are picked up and dropped off even when you need a last minute shuttle. Airport shuttle Our OR Tambo services are competitively priced giving value to your money. Moreover, if you have any special request, we can tailor the package to specifically suit your transport needs. No wonder many travellers prefer us to our competitors as our shuttle services are incomparable elsewhere! With Our OR Tambo airport shuttle service, you will always come first. This is the reason we are open 24 hours 365 days with the choice of making a booking by telephone or online. Let us be your first choice and find out why time spent on the road can be productive by relaxing, accessing emails or making calls.